Friday 1st November was a warm day with the promise of a better one tomorrow. The First Mate left work later than hoped so drove straight to Hastings while Captain Martin brought Manookatoo around from Yaringa Marina. With nobody else on the jetty we had our pick of spots and were joined later by Silhouetin', a local yachtie keen for an early sail with friends the following morning. We enjoyed a drink at the local Mariners' Bar and returned to the boat for delicious fish and chips and a reasonably early night. Many fishing boats were leaving and returning that night as the Westernport fishing comp was on and the carpark at the boat ramp was choc-a-block with cars and trailers. The captain arrives at Hastings! Saturday 2nd November dawned clear and sunny so, after a pleasant walk along Hastings foreshore we headed out of the channel and south. Sandy Point has always been a favourite destination in summer, so we moored offshore and took the brig to the beach for a walk. 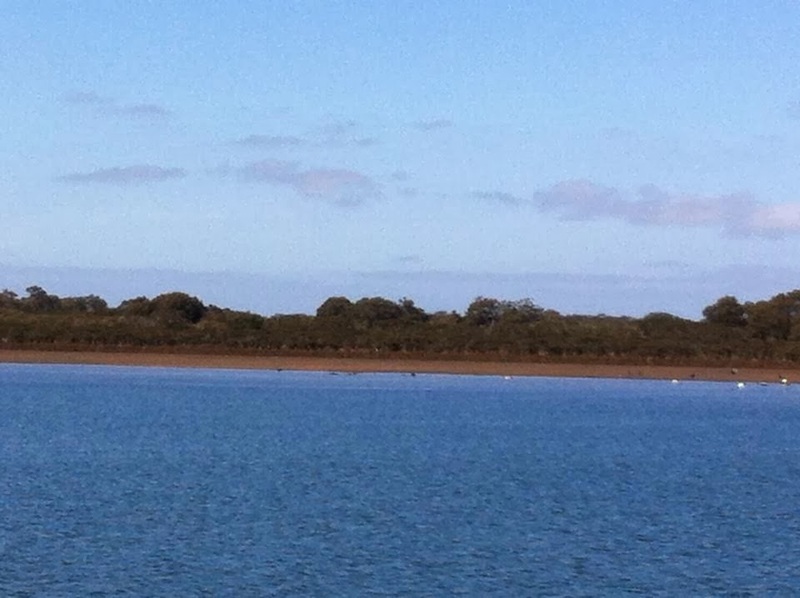 There is nothing more pleasant than that first trip of the season to Sandy Point - it is a sign that summer is coming. We walked around the headland and were amazed at the piles of seaweed and fallen trees on the shore facing Bass Strait - an indication of the wild winter weather that had come before! Returning to the brig we motored around the shallow bay and marvelled at the many fish swimming beneath us - maybe we needed a rod and some bait! After a delicious barbecue lunch we cruised slowly home, through yachts in full sail on a perfect day, including Cool Change, competing in the local sailing competition. Nothing looks lovelier than a yacht with its spinnaker billowing, but give me the comfort of our clipper any time!! The evening was spent at Yaringa Marina, as the forecast for Sunday was not good. Sunday, 3rd November dawned with grey skies and showers. After breakfast we packed up and headed home for a day ashore - we went to the movies and enjoyed dinner at a local "cheap and cheerful" Vietnamese Restaurant. Monday 4th November saw a return to fine conditions, so we returned to Yaringa optimistic for a couple of pleasant days aboard. We motored over to Tooradin for lunch, buying fish and chips for a second time that weekend and enjoying them offshore in the channel. Later we motored across the top of the bay to Chicory Lane, a small inlet off French Island. As it is within the Marine National Park no fishing is allowed so we were pleasantly alone. We had chosen this as our destination for the night - with no wind and mild temperatures predicted we were confident of a lovely night's sleep. We enjoyed barbecued Rib Eye steaks from Mario, our local Jells Park butcher, with a pleasant bottle of red to wash them down before retiring to bed, the lapping of the waves on the side of the boat lulling us to sleep. Tuesday 5th November - Cup Day - we woke to a blue sky day! As the tide rose we motored out of our lovely mooring and headed east along the top of French Island. 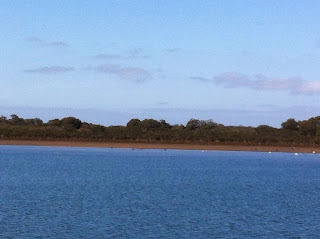 The water divides into many channels in this part of Westernport Bay and much of it is too shallow for a big boat like ours, but at high tide it is lovely to visit. We cruised along for quite a distance then dropped anchor for a Chicken and Champagne lunch, watching the highlights at Flemington on the TV, alone with the blue sky and a few water birds. Later on we motored back towards Yaringa, enjoying sunset drinks on the front of the boat before making pita bread pizzas for dinner. Tomorrow is a workday for the First Mate, while Captain Martin can continue to enjoy the balmy weather on Manookatoo! !